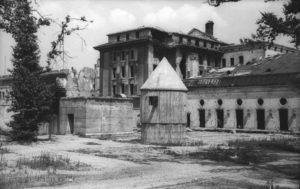 On 1 April 1945, Adolf Hitler vacated his apartments and his headquarters in the Reich Chancellery and descended into his bunker beneath the Reich Chancellery gardens: the Fuehrerbunker. From then on, he lived below ground and only occasionally ventured to the surface, the last time being on his birthday, 20 April (on which day he was 56 years old). 30 April: Hitler’s death by suicide. This entry was posted in World War II and tagged Eva Braun, Fuehrerbunker, Hitler. Bookmark the permalink.